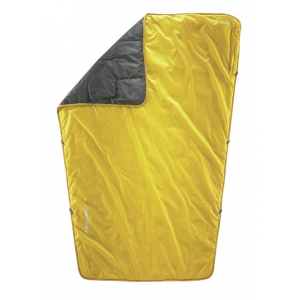 The Mac Gear Top Quilt provides good fit and warmth. 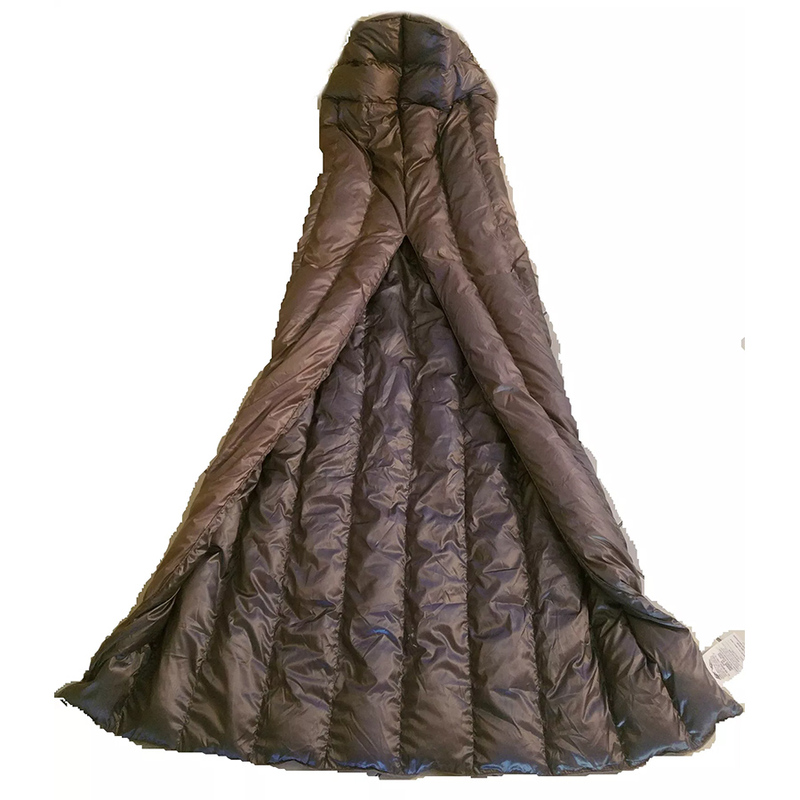 The Mac Gear Top Quilt provides good fit and warmth. This quilt is handmade in Florida of good quality materials and workmanship. If you have a Warbonnet hammock, this under quilt will fit nicely under the shelf. I got tired of trying to deal with sleeping pads in my hammock because I never could get them to stay in place while I slept. 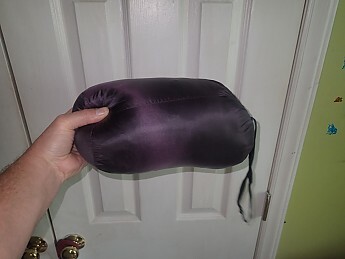 When using a mummy bag in my hammock, I could never get comfortable zipping it up and the bottom insulation did no good anyway. I guess my decision was made one cold night in the woods and one too many times my pad slid out from under me. Waking up cold had finally gotten old! My next problem was finding a setup I could afford. There are many excellent products on the market, but I was not prepared to spend 500 hundred dollars on a set of quilts. There are some synthetic options out there that are under 100 dollars, but they are typically bulky and heavy. When I found this Top Quilt for under 100 dollars, I was ready to give it a try. Bought the top quilt for 80 dollars. Total bag length is 76"
Width at the foot is 22"
My measurements differ from the dimensions on the tags. When I measured, I did not stretch and hold the quilt, therefore my measurements are more realistic to how the quilt will fit naturally. I have provided images of the info on the tags below. The Top Quilt fits me quite well with good wiggle room. The split is halfway up and meets me right at the hips. The shoulder width is good and versatile. There is ample fabric to tuck around your shoulders, or untuck and adjust for ventilation. I find it easy to enter and exit without the fuss of a zipper or hood. 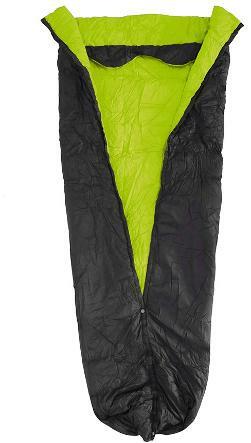 I have used this quilt in the hammock in a tent with an inflatable mattress. This bag is versatile in my North Carolina hiking habitat and is quite comfortable in temps hovering around 40°F up to the mid 60'sF. The loft of the Top Quilt I estimate to be around 1/2". The down appears to be of good quality and lofts up nicely when you remove the from the stuff sack. In fact, when I release the stuff sack cord, the bag immediately pops out as it lofts up. The quilt packs up compactly and nicely in the stuff sack. 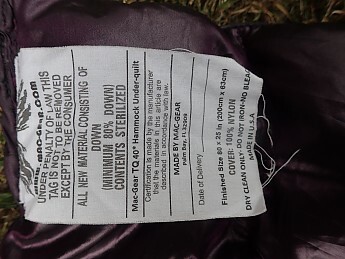 The stuff sack is made of the same material as the shell. By the way, the bag is made of some type of very light nylon that is quite slick, making it very easy to compact into the stuff sacks. The stitch pattern is in 3" squares sewn through. 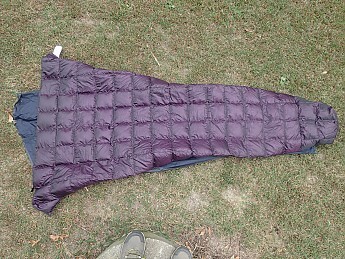 This is typical for warm weather down sleeping bags and some down jackets. 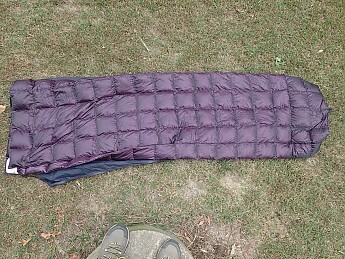 At a price of 80 dollars for each, I am very pleased with the Mac Gear Top Quilt and Under Quilt (see seperate review). They perform well, are inexpensive, easy to use and carry. In fact I may be asking MAC Gear if they can provide me with another set for cold weather! Not a bad price. Nice review, Soleful! Save yourself some worry, order something else. I wish I could speak about the quality. I placed my order on the 3rd of May, (it's the 10th of june) and still have yet to receive it. When I ordered, it said 16 in stock. I've now sent a few emails, texts and Facebook messages just to know when it's coming. A few weeks ago I sent an email checking in, asking if I could at least get an estimate (there aren't any notes about lead times on the site). They said it has shipped, but the tracking info on the website still says the package has been "created" and not shipped. This is the ONLY response I've gotten. I don't need it for another two months, but I'm getting more and skeptical, and I'll be ordering something else soon from a real company. Do the right thing, and go with someone who's passionate enough about what they make to get it into people's hands. Welcome to Trailspace, Quinton. Did you ever get your quilt? Not yet. I'll be sure to update the review when I do. Terrible customer service and total false advertising. The temp rating is total B.S. I got the 35 degree down top and underquilts. When I was thinking about purchasing them I emailed the company through the website and got a response back within minutes. A few days after making my purchase I heard nothing about shipping or when I'd receive my order so I emailed them... Nothing. I emailed again, nothing. I called, nothing. I texted, nothing. I found their Facebook page and sent a message, nothing. I made a post on the page that was public and finally heard back. I was promised an email and tracking info and never received anything. I did receive my top and underquilt a few days later. I took them out and it was around 40 degrees and I was cold. A little while later while preparing for another trip I noticed that the tags on the quilts said that they were 40 degree quilts. I had to take them on my trip last weekend anyway because that's all I had. It got down to 35 degrees and I froze! I have never been so cold in my life. I tried adjusting them, I put more clothes on. I tried everything. They are not 35-degree quilts. They are modified Costco blankets of which I had made my own already and did a better job on them. I could have saved myself $150 (I paid $190) and made a second set. I have sent many emails to them prior to writing this review trying to get them to come to a solution with me but just like before I left a post on their Facebook page (now posts from the public are private) I have heard absolutely nothing. Welcome to Trailspace, Tim. Thanks for sharing your experience with these quilts. Too bad it didn't work out. A great low cost warm weather quilt. 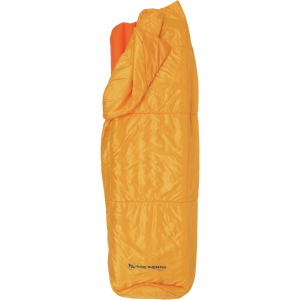 Mac-Gear's 40-degree top quilt works in a hammock or on a sleeping pad. Available on eBay or Amazon and at Mac-Gear's website. 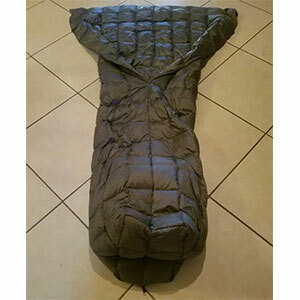 I bought the Mac-Gear 40 degree top quilt from eBay. 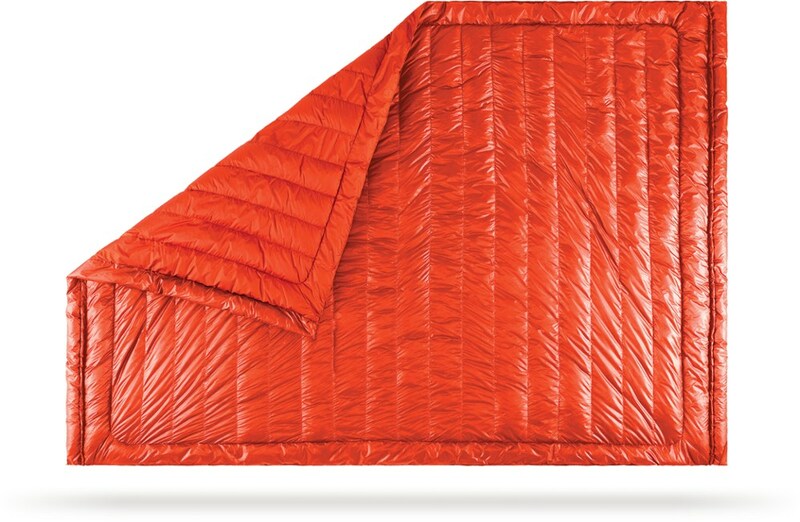 I chose it over other ultralight quilts simply because it was only $75. It took longer to ship than it should have, but it arrived in time for my hike at the Dolly Sods Wilderness area. Mine weighed in at 15.3 ounces including the stuff sack. I have only slept in it one night but am very pleased with its performance. It was about 55 degrees outside and I would guess 60 degrees in the tent. I was too warm to get fully under the quilt and feel like I could use it down to the rated 40 degrees if needed. I am 6'1" 220 pounds and found the length and girth to be fine, although I wouldn't want it any smaller. I would consider myself to be a warm sleeper, so if you are not this might only keep you warm down to 45 degrees or so. Welcome to Trailspace, Duane. Thanks for bringing this brand to our attention. I hope you'll keep us posted on how your top quilt continues to work out for you. 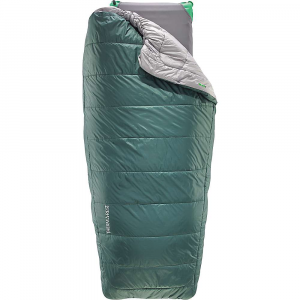 The MAC-Gear 40 Degree Down Top Quilt is not available from the stores we monitor.